“What is Language Access?” asked Mary Jayne McCullough, Founder and Executive Director of Global Wordsmiths to a room full of service providers during Inclusive Innovation Week 2018. Language Access requires effective communication, interpretation, translation, trained multilingual employees, and qualified translators. After 15 years of professional working experience in the Language Access industry, Mary Jayne has seen it all. She has been in several different roles such as a Spanish translator, interpreter, and community advocate. Through her work, she noticed the lack of comprehensive Language Access services in the region. Services are extremely limited in comparison to other cities with larger and more diverse populations. That’s why Mary Jayne founded Global Wordsmiths one year ago. Global Wordsmiths is a social enterprise dedicated to improving language access for Limited English Proficiency (LEP) individuals. The company provides translation and interpretation services as well as Language Access consulting, competency building, and full stack infrastructure development. 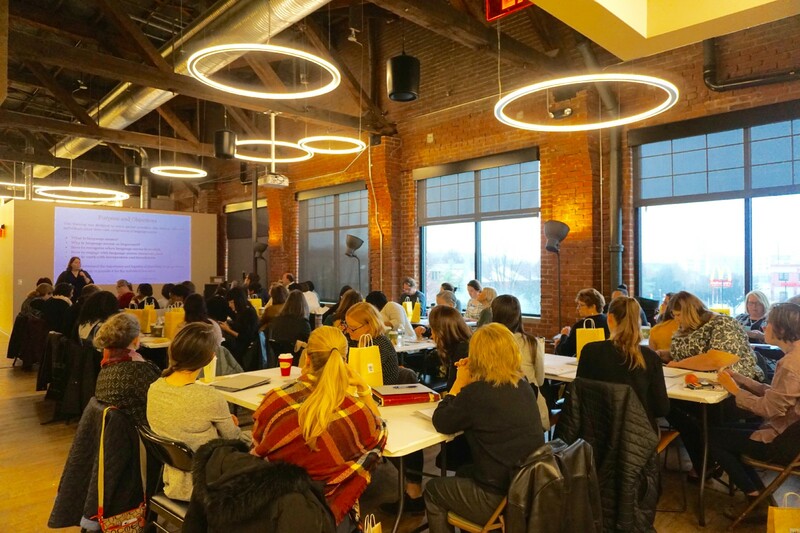 In PGH Lab 3.0, Global Wordsmiths is testing its full Language Access consulting stack and identifying best practices by rolling out an organization-wide Language Access plan. “Any organization providing vital services can benefit from Global Wordsmiths’ Language Access training.” — Mary Jayne McCullough, Founder and Executive Director of Global Wordsmiths. The number of non-native speakers in Allegheny County is increasing rapidly. About 82,395 individuals speak a language other than English in Allegheny County and a third of these individuals are considered LEP (Global Wordsmiths, Language Access Summit 2018). The Housing Authority of the City of Pittsburgh (HACP) has been serving increasingly higher numbers of limited English speakers and wants to learn how to implement an organization-wide culture where employees are equipped with the necessary tools to better service these individuals. Global Wordsmiths helps organizations to incorporate, learn, and implement language access services through a customized strategic plan. As part of PGH Lab 3.0, Global Wordsmiths has been working with its City Champion, Knowledge Hudson, Government Liaison and Project Coordinator for HACP. The startup company aims to equip HACP’s managers and customer-facing employees with practical skills needed to better serve immigrants and refugees living in Pittsburgh. Skill-building activities include conducting cultural competency workshops, helping HACP identify multilingual staff to provide support in case of emergencies, and implementing a plan of action for the organization to better engage with translators and interpreters in the future. So far, Global Wordsmiths has identified 13 managers and customer-facing employees at HACP who regularly interact with LEP individuals. They also conducted their first Language Access introductory training for six customer-facing employees in the Occupancy Department, the first point of contact for Low-income Housing Program and the Housing Choice Voucher Program. The startup company will continue training HACP employees from different departments throughout the month of May. 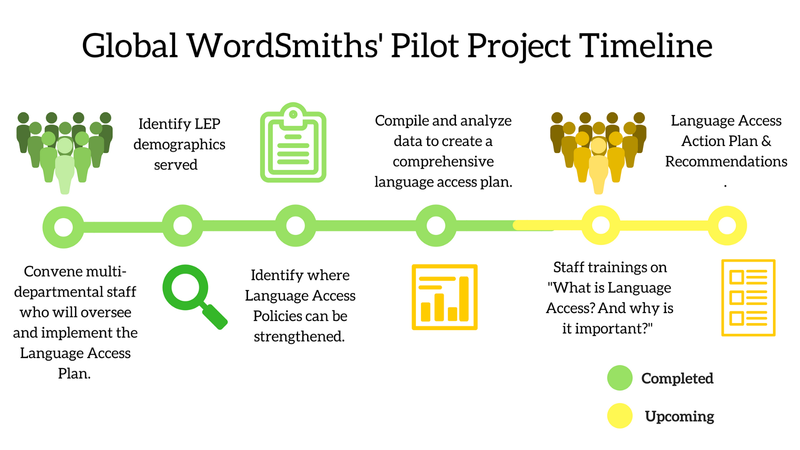 At the end of the pilot project, Global Wordsmiths will provide HACP with a Language Access action plan and recommendations to implement in the future. Global Wordsmiths is a 100% woman-owned and operated business. Over 90% of Global Wordsmiths’ employees are women. Five of them are full-time employees and 48 are independent contractors. Read more about PGH Lab 3.0 companies in the next blog post coming soon! PGH Lab brings local entrepreneurs to beta test products and services in local government for 3–4 months. Get inspired to start working on your own innovative ideas. Make sure to stay connected and ask questions about PGH Lab through our twitter! Thanks to Sanjana Dayananda and Pittsburgh I&P. The Department of Innovation & Performance is building a 21st-century government for the City of Pittsburgh and its residents.